The Benalmádena Cableway (Teleférico Benalmádena) offers a spectacular trip of fifteen minutes of duration in comfortable and modern cablecars, each with capacity for four people, on a route that unites Benalmádena Coast and the top of Calamorro Mountain, one of the most elevated enclaves of the Costa del Sol, to nearly 800 meters of altitude above sea level. Besides viewing an exclusive landscape it is possible to enjoy many activities for visitors of all ages. On the top of Calamorro Mountain, you can enjoy views without comparison of the Costa del Sol, Sierra Nevada and, on clear days, Gibraltar and the African Coast. 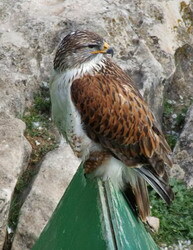 Almost from the sky, it is possible to enjoy exhibitions of predatory birds, with hawks, eagles, owl and vultures, spectacles of the taming of Spanish horses and the various adventure sports including mountain climbing and mountain walks with footpaths that lead to different viewpoints. 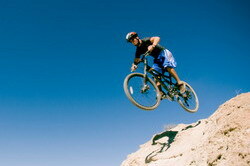 There are also paths for mountain biking for the really adventurous. A cafeteria sells tasty meals, with fantastic views. 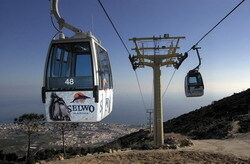 To get to this adventure, take the Fuengirola/Malaga Renfe train to Benalmadena - Arroyo de la Miel - stroll up to the cable car which is situated next to Tivoli World. 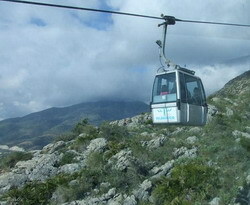 The cable car costs 13 Euros per adult and 9.80 Euros for children. (Prices subject to change).